The Holidays are almost here. Need a break from the hustle and bustle of Black Friday, Cyber Monday, and general overload? 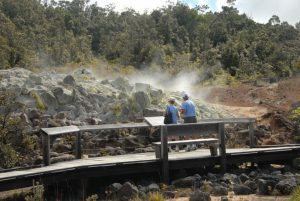 How about hiking in Hawai’i Volcanoes National Park? Enjoy a private guided tour with one of our scientists or naturalist – great for family groups. Plus, any private guided tour you do, the proceeds go to support vital park projects and programs. With that said, we encourage you to be a hiking philanthropist.